Jesus Christ Superstar is a 1970 rock musical with music by Andrew Lloyd Webber and lyrics by Tim Rice. The musical started as a rock opera concept album before its Broadway debut in 1971. The musical is sung-through, with no spoken dialogue. The story is loosely based on the Gospels’ accounts of the last week of Jesus’s life, beginning with the preparation for the arrival of Jesus and his disciples in Jerusalem and ending with the crucifixion. It depicts political and interpersonal struggles between Judas Iscariot and Jesus that are not present in the Bible. Jesus Christ Superstar is a 1970 rock musical with music by Andrew Lloyd Webber and lyrics by Tim Rice. I was disappointed in the story . . . a little heavy on late-sixties angst. The tale is told by Judas (Loucas T. Curry), which is actually interesting. Many scholars portray him and some of the apostles as zealots and vehemently opposed to the Romans ruling on Jewish grounds. The production shows Judas as someone who is mad as hell and isn’t going to take it any more. And we see Jesus (Bruce Haasl) as a confused, gentle person, asking his lord for guidance . . . a man. But the figure who denounced the greedy, blantant money grubbing of the money changers in the temple, over-turned the tables and physically put a stop to the corruption sounds more like a determined individual who knew what he was doing and the possible consequences . . . a leader. We’re left wondering who and what was Jesus, so I guess nothing has changed. A Donald Trump cabinet of political toadies wearing dark suits and long red ties as the temple priests. I really enjoyed the Donald Trump cabinet of political toadies wearing dark suits and long red ties as the temple priests. 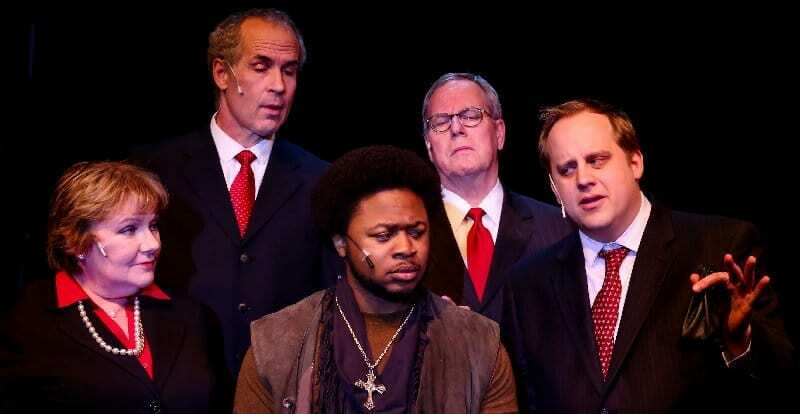 Seen in the photo are Annas (Karen Christnesen), Priest (James Klarich), Judas (Loucas T. Curry), Priest (George McClure) & Caiaphas (Aleks Merilo). As a rock opera I thought the TLT production was disappointing. When you call something a rock opera and show characters walking around with electric guitars and you don’t have the amps and speakers cranked up to eleven (even without a house band) . . . you’re letting the trophy fish off the hook. Without the band the music could still have been pumped up, but I’m sure many people in the audience wouldn’t like it as loud as I do. Loucas T. Curry who played Judas will have no voice by the end of the run. I think he had the wrong part. Loucas portraying Jesus with righteous indignation would have been a breath of fresh air. Loucas did a fantastic job in Smokey Joe’s Café two seasons ago. The set by Blake R. York was excellent. the ramp/runway creating a cross really set the tone. The lights and the fog worked their spell as well. Hats off to Jill Heinecke (Stage Manager/Dance Captain). With a large cast of people mostly dancing and moving, it takes skill to make everyone look good. Jill has been active on-stage and backstage at TLT. She got her acting and directing degree from Pacific Lutheran University. Jill, combined with director/choreographer Lexi Barnett, delivered some excellent moments on stage for the dancers. My favorite scene involved King Herod (Andrew Fry) and his harem girls (left to right: Melanie Gladstone, Caiti Burke, and Shauntal Pyper). Actually, Andrew Fry without sunglasses resembles Andrew Lloyd Webber. I loved the hand gestures by Melanie Gladstone. She is a teacher of the Deaf and Hard of Hearing and consulted on the TLT production of Children of a Lesser God. My favorite scene involved King Herod and his harem girls. Must have seen a different production than I did. Couldn’t disagree with many of the points made in this “review”. I think that Loucas Curry as Judas was brilliant. His voice makes you feel the uncomfortable feelings you should when dealing with the character. If you were disappointed by the story, where have you been since this was released in the 70′? It’s a classic in the theatre world and a timeless story. Thanks for reading and for your comments. It is a classic and a timeless story. I think however the book Zealot cast a new light on the events. I do like Loucas Curry, but cast as Christ I think would have had more impact. I’m always entertained at TLT and am really looking forward to the Scottish Play at the end of this season. Please, keep reading and writing.